Children have fundamental problems in their picture of the Earth: their experience is of a seemingly flat one, they have seen it depicted as a circle in their science and geography chapters, and some have made model solar systems with the Earth and other planets lined up. They have difficulty connecting these depictions to the round Earth they live on; they wonder if we live in or on it, why, if the Earth is round, people in the Southern hemisphere do not fall off, and even why the Earth itself doesn’t fall! So how can these ‘flat Earth’ theorists be persuaded otherwise? The activities that follow address the root of these conceptual problems. They compel children to confront their difficulties, and help them arrive at the correct picture in a matter of a couple of weeks (conceptual change does take time, and that time must be allowed). Activities that may well be situated in different disciplines are used to inform and address the conceptual problems involved in acquiring the concept of the round Earth. This is a photograph of the Earth taken from a spacecraft, which was very, very far from the Earth when it was taken. Ask for a description of what children see in the photograph. Involve the whole class in describing it – perhaps each child can add a point. Ask for a guess – what are the white things in the photograph? Using a globe or an atlas, have children find out which countries or continents are seen in it. 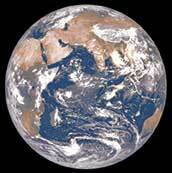 Repeat with more pictures of the Earth – which countries, continents and oceans are seen in them? Point to ponder: Why don’t you see people, homes, trees, and hills in the photographs? What this activity does: Using actual photographs of the Earth, and identifying its features, helps connect it to the Earth we live on. Also hints at the scale of the planet. The author is an astronomer who is on the faculty of the Homi Bhabha Centre for Science Education, Tata Institute of Fundamental Research in Mumbai. She has been working in science education since 2000; her current research is on several aspects of science teaching at the school level. She can be reached at jvijapurkar@gmail.com.